in Newark on Trent Cemetery, Nottinghamshire, U.K.
Wellington Mk 1C nr R1443 took off from Syerston at 22.01 for a raid on Le Havre, France, and was believed shot down over the 40 km SW of the island of Texel by enemy ship's flak. 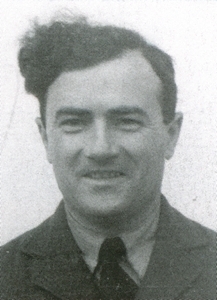 The crew were F/O (Pilot) Antoni Sym, Sgt (Pilot) Władysław Żolnowski, P/O (Obs.) Feliks Sobieralski, Sgt (W/Op) Leon Hampel, Sgt (Air gunner) Stanisław Białek, P/O Stanisław Duchnicki (Obs. flying as air gunner). Several of these had flown on the Squadrons maiden operation. 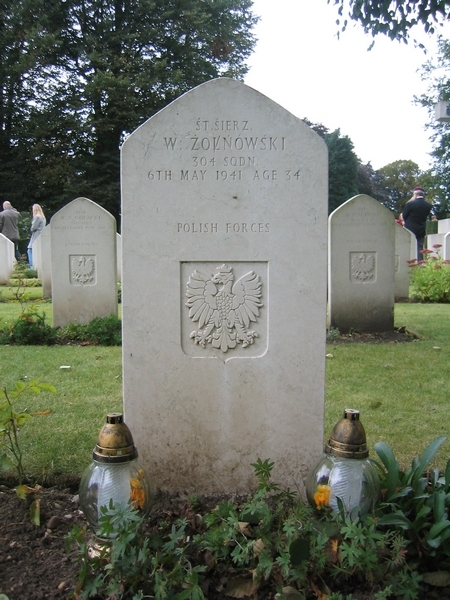 The sea brought the bodies of Sgts Żołnowski and Hampel to the British shore: Żołnowski is buried in the cemetery at Newark and Hampel is listed at the cemetery at Eastbourne, Sussex. Sadly, no graves are identified for the others in the crew. 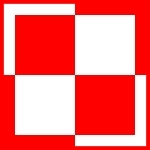 The note of an Unidentified Polish crew member buried in Eindhoven is not correct. He belonged an other crew.